Trees at the front of our new house. I couldn't sleep last night. Okay, maybe it wasn't a full-fledged anxiety attack according to the clinical definition, but I laid in my bed awake, bombarded by one worry after another. The date of my last paycheque is quickly approaching. I have worked my entire life since age sixteen, mostly full time, but always at at least part-time. During my university years, I worked in the summers to support myself over the school year, and generally also worked part-time during the school year as well. Many of those early jobs were minimum wage ones, and supported only the most meagre of lifestyles. But the point is, I always had a paycheque. A wave of panic came over me. No more paycheques! No money! What am I going to do? And on top of that, our property tax is due July 1, the day after I retire. Rob's car insurance is due. I've run up a big credit card bill for work-related travel, which has not yet been reimbursed. And I have been financially helping out my two younger (adult) children as they pursue post-degree programs this year, which has made a dent in my savings. Once I retire, I'll have to pay for medical costs such as extended care, dental, and medical travel coverage, which previously have been provided by my workplace as benefits. What if our house doesn't sell? 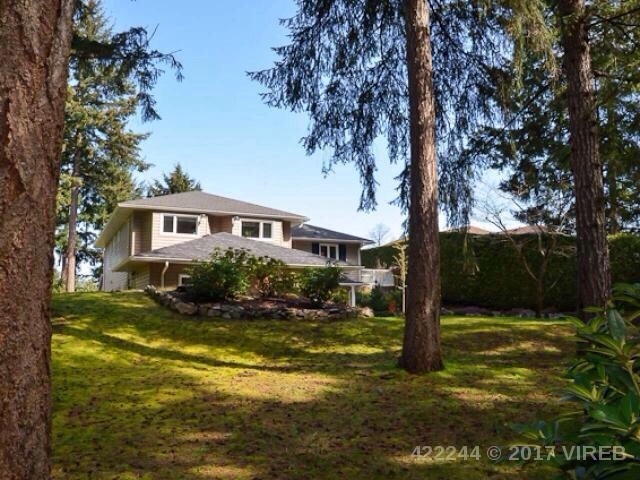 It is a lovely house that should be attractive to buyers, but we are selling in a slow market. We have already bought another house, and we get possession June 30, the same day I retire. We will be responsible for the mortgage and closing costs, whether or not our current house has sold. Hyperventilating! We have decided that we will stay where we are in our current home, and not move until we have an accepted offer. This thought brings two additional worries flooding in. We haven't got quotes or made any moving arrangements yet because we don't have a moving date. What if the movers are all booked up and we can't arrange to move when we need to? Or if we only can do so by paying an exorbitant amount? The other worry is about my office at work. As I will remain affiliated with my workplace after I retire, I have requested temporary office space after June 30. But what if I have to move offices, again, after just moving last year, to a dark windowless room in the basement? That would be unpleasant. But, digging a little deeper, it is not the possibility of having to move offices that is bothering me. The real thing I am worried about is that I am not 100% ready to leave. My career has been more than a job; it has been an avocation and a big part of my identity. Loss of an office symbolizes more than losing space at the workplace. It means that I am really and truly stepping away from the life I have been living for more than 30 years. Well, good grief, what did I think retirement was, if not leaving the workplace and leaving my career??? Deep breath. By now, I have gotten up and gone out to the kitchen and made a mug of hot chocolate. Of course I won't have a paycheque. Why would an employer pay me if I am not doing any work? I don't want to work so hard for pay anymore. That is why I am retiring. Just because I won't have a regular paycheque doesn't mean I will have no money. I will have a small amount of pension income plus the retirement savings that I have spent my whole life saving and investing so that someday I would be able to retire. I just have to wrap my head around the fact that I will no longer be putting money into those savings. Instead, I will begin drawing it out. It is obvious. I know it intellectually. I have planned for it, and have run the numbers over and over again, just to make sure that I can afford to retire. But somehow, now that the moment has come, it is still hard to accept that there will be no more paycheques. We have a new house! It is beautiful, and I am so excited about moving into it and making a new life for ourselves on Vancouver Island. It has space in it for me to have an office at home, and space to paint, and a beautiful workshop for Rob. 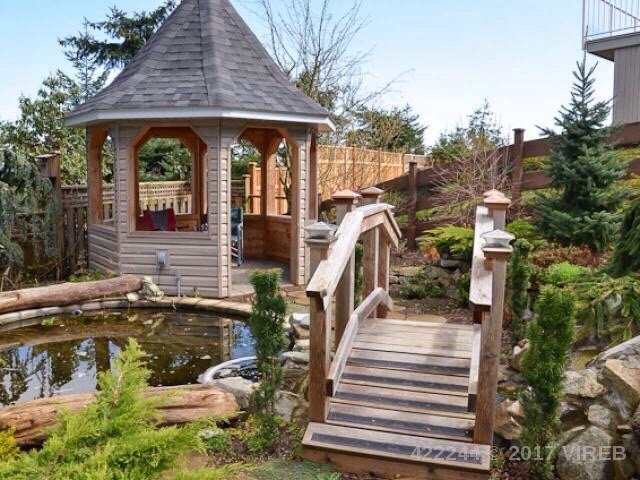 It has lovely gardens, and best of all, it is near my kids, grandkids, and southern BC friends. We have done the math. We wouldn't have made an offer on the house if we couldn't afford it. We have made financial arrangements and can cover the carrying costs while we wait for our house to sell. The backyard has a pond! I am going to love being retired. I can write. I can paint. I will have time to garden and have outdoor adventures. I will not miss working my face off, and all the tiresome politicking of the workplace. If I really miss work, well then, I can take on a short term contract with my current employer, or one with a similar organization nearer to our new home. I have marketable skills that will continue to be in demand for some years. Worry, worry, worry. Why do I do it? It serves no useful purpose. It just keeps me up at night, and distracts me from all the joys of finally truly having time to do what I choose. Yesterday, my grandson came rushing out from under the decorative bush at the end of the driveway - his fort. He had an armload of sticks which he tossed back under the bush. "Grandma, I'm making a bomb fire!" he explained with great excitement. Then he picked some red and pink leaves from the bush and threw them onto his pile of bonfire sticks. "Here's the flames of the bomb fire." 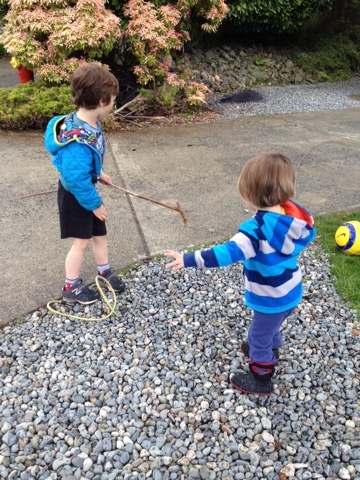 Next, he began dragging some bungee cords that he had hooked together, and pretended that it was a fire hose. He squirted imaginary water on the bonfire, talking about the bad guys who made the fire and how he had to rescue the people in the building. 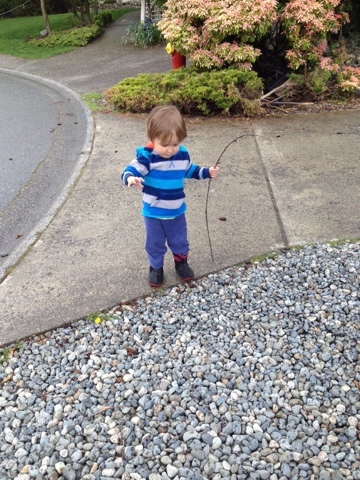 My younger grandson, aged two, observed his older brother, aged four, and picked up a stick. "No, no! That stick is on the fire!" said "E", snatching the stick away. Then we negotiated finding "C" a different stick to play with, one that was not part of the fire drama taking place under the bush. Still watching his older brother, C began plucking red leaves from the bush and delivering them one by one to me to hold for him. Honestly, I don't know why we even bother with making plastic toys, when sticks, rocks, leaves, and dirt (and bungee cords) provide so much scope for the imagination and hours of fun. As you might have guessed, I am presently on grandma duty. I am staying with my two grandsons for a week while their parents are out of town. I live far away in a different province. Although I have visited quite often, this is the first time that I have looked after them for multiple days. I had forgotten how exhausting a day with two preschoolers is! And how early the morning starts! Poopy diapers, two-year-old contrariness, wheedling for sugar, eating toothpaste, sibling disagreements, disappearing socks, and the many places where food can be smeared. On the other hand, there is nothing quite as sweet as a cuddle and kiss from a toddler. Or the seriousness of a four-year-old explaining about a seffascope for looking at the sky, or asking concerned questions about Snow White's evil step mother. I was grateful that E was able to help me figure out how to remove the diapers from the complicated odour-free diaper disposal system when it became full. Both boys love to be helpful! We have been to an outdoor preschool program, swimming lessons, soccer, a science centre, gym drop-in, and the playground. Every day we read many, many stories. E enjoys long books and has amazing knowledge about the natural world, and about how things work. C is very interested in animals, music, buses, and construction machines. I am so lucky to have this opportunity to spend intensive time with my dear grandchildren. They are growing up so fast! I will recover from a week of being tired at the end of each day, and I know that the long grind of full-time childcare is in my past, not my future. But if I didn't have the chance to spend time like this with them now and from time to time, I would miss out on truly knowing them as young children. I expect that being a grandma will be one of the best things about being retired. The tulips are blooming. They are late this year. Most years they bloom in the latter part of April. 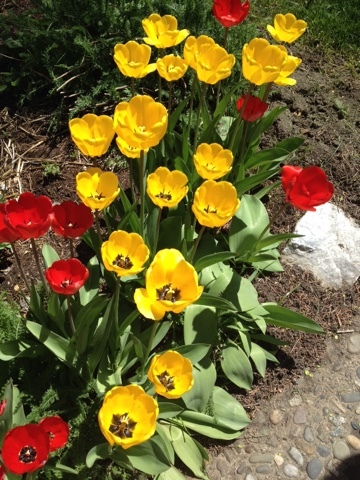 They are Appledorn tulips and they look gorgeous -- all red and yellow. I purchased the bulbs from a garden club the first year that we lived here and planted them in the front perennial bed. Every year I look forward to their cheery welcome of springtime. But, as I said, they are late this year, and I think they are doing it on purpose. You see, we have listed our house on the market. We are planning to sell and move to the coast. Since returning from our Easter travels, we have worked hard to clean every inch of the house and trim the yard. We have decluttered, and reorganized, and given many boxes of things away. Ten days ago, we met with a realtor to discuss the marketing plan and complete the listing contract. We have had a consultation with a home stager (Every surface must be bare! No clutter! ), and a photographer came through the house, and then another photographer who has created a 3-D virtual media tour of the house. Tomorrow the listing is supposed to appear on the MLS website. For weeks, the weather has been unseasonably cold. The tulips grew green and healthy, and developed big fat buds. But they refused to open for the photographers trouping around the property taking photos (although fortunately we had sunny weather for both photo days). The day after the last photographer came, the weather turned hot and summery. The tulips bloomed and looked glorious. It is almost certain that they will have finished blooming and dropped their petals before the first viewer comes through the house. So you see why I say that they have a mind of their own! In the meantime, we continue to clean, clean, clean. We have repainted the front door and vacuumed the patio. 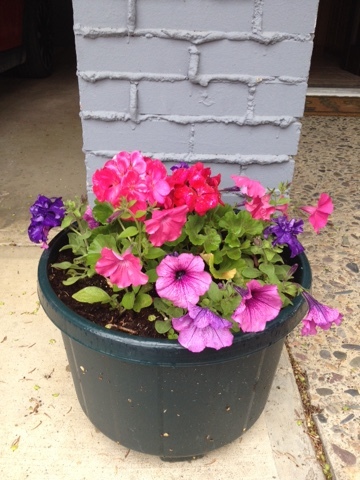 We have washed the windows and planted pots of petunias. Although we have always kept our place clean, we are not model housekeepers. We like a certain amount of clutter; it creates a homey, comfortable feeling. But now all the family photos have been put away. Books and magazines are no longer strewn over the coffee table, but are neatly on shelves or in the magazine basket. No socks are on the floor. No shoes are piled beside the door. Every faucet and mirror sparkles. Even as I pause from my tidying to write this post, Rob is chugging from room to room with the vacuum cleaner. Well, it looks like the rain has stopped. I'm heading outside to do some gardening.